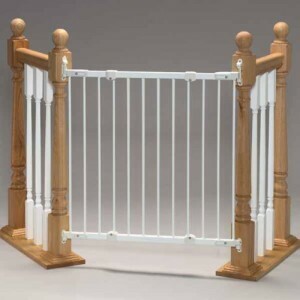 Angle mounted baby gates are ideal for blocking access to areas without parallel mounting points either at doorways, curved stairway bottom or odd-shaped areas. Most of the standard gates usually do not fit in such areas, hence the need of these angle types of gates that can fit in curved, and uneven wide areas. Angle mount gates have been designed to allow you to create asymmetrical configurations that will fit the layout of your home. They are a great way to provide your baby with a safe environment to explore and grow in. Using these gates, it is now possible to install a barricade wherever you need one, no matter the shape or layout of your home. With the flexibility to suit odd shaped spaces, they can be placed in irregular hallways and on top of those angled stairs. Without having to change the design of your house in order to accommodate the positioning of a safety gate, these angle gates will suit your needs. Especially useful for spiral staircases where the railings don’t line up, as well as other angled parts of any house. This espresso colored gate is hardware mounted to the wall and features sturdy, heavy duty metal construction with a matte bronze finish. It works for either angled or perpendicular walls. It measures 30 inches high and easily adjusts to fit openings of 38.3 inches to 72 inches wide. This gate has a walk-through single door with a stay open feature and double locking system that is child-proof. You can position it in several angles using its adjustable hinges which allow you to tighten and loosen, in order to bend the gate whichever way you want it to go. It comes with an installation kit included. 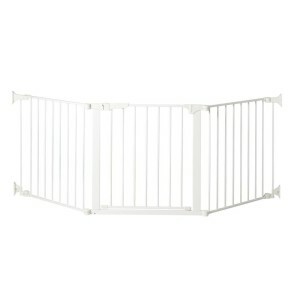 This Kidco metal gate swings out without any under bar that would be a tripping hazard at the top of stairs. The child lock is easy to open for adults or children over 4 years and easy installation is also guaranteed. It fits between 28 to 42 inches and extensions are available here to extend the frame to up to 63 inches. It is one design that can fit in any place.It is also available in white color. With a one handed operation, you can lock and unlock it without any hassle. It opens in both directions for easy back and forth movement in hallways and corridors, but also has an optional stopper to block one direction especially when it is installed on top of stairs. It is hardware mounted to secure properly for use anywhere.If you don’t wish to drill into your wall, there are additional gate installation kits available here to give you a strong fit without a hard installation. 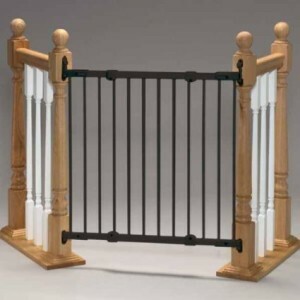 This auto close metal gate comes with an excellent non-toxic powder coat finish .It secures a width of up to 84 inches and has a height of 31 inches. This particular gate comes with 2 sections each having a width of 24 inches and another 1 section with a width of 30 inches. This wider section has a 23 inches wide door. It is hardware mounted and screwed into the wall. It is available in either white or black color. It is perfect for unusually shaped and curved stairway as well as wide areas such as fireplace areas. Optional extensions are available here and here if required. This gate has a magnetic auto lock feature to allow you to automatically lock the door behind you. The hold-open button feature gives you the option to keep the gate open. It is very adjustable with joints that freely rotate to match angled areas. The best feature about these gates is the ability to adapt to the constraints of your house, allowing you to place it anywhere you please, according to the specific safe zones. In addition to giving you that freedom, this angled design works just as easily as any other gate.